As posted in my December 2011 entry: Parabolic mirrors that produce electricity, harnessing of energy is done indirectly by converting concentrated sunlight into heat. This heat will be used by a steam turbine or a heat driving generator to generate electricity. Hence, the name solar thermal. It is a known fact that Thailand is ahead of all other Southeast Asia nations in terms of renewable energy initiatives. 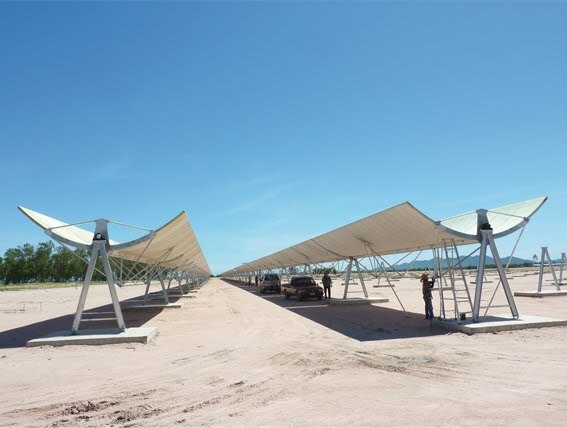 Recently, Solarlite - a German concentrated solar power technology provider - commissioned Southeast Asia's first direct steam generation parabolic trough plant called TSE1, to supply 5 MW of electrical power to Thailand's public power network. TSE1 is the first of 15 CSP stations planned by Thai Solar Energy and when completed, total generating capacity will be 135 MW. There is a feed-in tariff, FIT, scheme in Thailand for small energy generation system of up to a capacity of 10 MW. Similar to Malaysia's initiative through SEDA, Thailand's aim is to give opportunity to people in the remote areas to participate in electricity generation, especially from renewable sources. What makes Solarlite installation in Thailand special is that this is world's first in Direct Steam Generation. Instead of heating a thermal oil, the solar energy heats up the water that flows through the parabolic trough collectors receiver tubes. Therefore, no heat transfer oil is needed and heat exchanger - one of the expensive components in the CSP plants - becomes redundant. This means that the CSP plant is more ecological and safe as it uses only water. 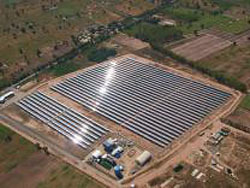 Second plant, TSE2 is currently under construction and all of Thailand’s current Solar Program is targeted to be completed by 2015. New program was recently announced, under which 2GW of solar capacity from both solar thermal and Photovoltaic must be installed by 2020 as part of Thailand’s commitment to sourcing 25% of it total energy requirement from renewable energy sources. The TSE1 plant does not have energy storage capacity as it is not economical to install storage system for small plants. Meaning, every time clouds shade the plant there would be power outage. Furthermore, Thailand's FIT which has a framework of 10 years and maximum 10MW of plant generating capacity deprive Solarlite the benefit of economic of scale. The current feed-in tariff for energy generated from CSP is 11.5Baht/kwh (about RM1.12/kwh). Compared with Thailand, FIT scheme in Malaysia is structured to run longer i.e. up to 21-year with more competitive rate, especially Solar PV. This scheme is however limited to only 4 sources of renewable energy, not including CSP. To recall, the four energy sources that enjoy the Malaysian FIT scheme are Solar PV, Biomass, Mini Hydro and Biogas. Solarlite in an interview with CSP Today stated that if they can make it and be successful in Thailand, they can make it anywhere, and that include Malaysia. They have the advantage of producing components in Southeast Asia (Thailand) and with the right approach with our government, there's no reason why can't CSP be implemented in our country. We can start with the remote areas to power up the rural population. betul la.. sebab, kalau mau harap hidro sangat pun, actually utk jangka panjang, the cost is something juga.. good info bro!! I love the idea of solar power. Firms are pushing solar panels here in the UK but they are so expensive and it would take approx 25 years to recoup the cost. Also we don't get much sun here. @Aki. Kalau ada lokasi yg dekat2 sini, sa sebenarnya lebih berminat mini hydro. Best! @Elih Japahar. Itu tagline Dr Jeffry kaitu bos? Tapi kos untku initiate RE ni mahal, kerajaan mungkin timbang sana, timbang sini, akhirnya hasil kurang 'gah' utk dilihat mata kasar rakyat. Tu lah slow sikit dorang buat implementasi. @sharomnasrudin. Tunggu bajet yg tak kesampaian agaknya bro. I think our government should done it earlier....see even Thailand now can think what is the good for their rakyat benefit. All budget gone no where....very sad. Interesting new development in harnessing solar power.